Distributor: Currently licensed by Discotek Media, and also available streaming on Crunchyroll and Viewster. Also Recommended: Galaxy Express 999, Galaxy Railways season 1, other Matsumoto shows of quality average or better. Notes: Based somewhat loosely on works by Leiji Matsumoto. A planet drifts along in the universe, unacknowledged by the Galaxy Railways as if it doesn't exist. The planet, however, has no intention of being forgotten, and so mysterious illusions appear at random in various locations for short amounts of time, and then shattering into small fragments and drifting off into space. What happened there in the past, that caused such an event? Why does this draw the attention of Maetel and the Three-Nine? And where does Killian Black fit into all this? If any of you ever wondered whether Galaxy Railways fit into the whole Galaxy Express 999 continuum, then A letter from the Abandoned Planet is here to set things straight. Some time after I had written my review for the original Galaxy Railways series, I got an Email from a fan asking just that. At the time, I didn't really have an answer for him, although in his following mails, he offered a screencap from the first episode of the show, which did indeed feature the Three-Nine. It was your average farewell sequence, though, so I must have blinked when they showed me the front of the train itself. Tetsuro and Maetel were nowhere to be seen anyway, so I guess I could be excused for thinking that maybe the two shows didn't really have anything to do with each other after all. That is, until A letter from the Abandoned Planet came to settle this once and for all. Timewise, I'd place this somewhere in the beginning of the second Galaxy Railways series. This is mostly due to Killian Black being a member of the SDF and under Manabu's command. Since the second season introduced Killian and then later transferred him somewhere else within the halfway mark, this should be a safe assumption. And seeing as the easily recognizable character of Maetel makes her arrival at the very beginning of this OAV, the connection is settled permanently. Unlike with Galaxy Railways, though, I'm uncertain about exactly where she and Tetsuro is timewise compared to the other shows they star in. The only clue I have is that Tetsuro himself is even well known among the Galaxy Railways and the SDF, so obviously some time must have passed since he first gained the opportunity to ride the train of destiny. The show itself seems to want to tinge itself with the same kind of bittersweet tragedy as you'd find in the original Galaxy Express 999 series, although not quite to that length. Maetel looks and sounds like her usual self, burdened with a past of universe-crushing proportions and voiced by her traditional combination of sadness and resolve. Tetsuro, on the other hand, still seems to be rather gung-ho and cheerful most of the time. As for the SDF crew... well, I guess you could say they are their usual selves, save for Killian, whom this show seems to be centered around. I'm still not entirely sure what to think of this show. On one hand, I will admit that I have been wondering about the connection between the two universes, if briefly. On the other hand, maybe I expected a little more than this when I first got the opportunity to have my questions answered. Maybe it's because, when it comes down to it, Maetel and Tetsuro are just guest stars in what basically amounts to their own trademark... well, thing. 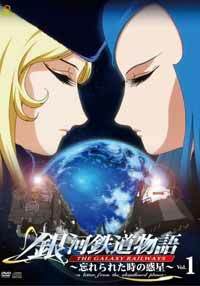 The show's titular "abandoned planet" draws the attention of Maetel, because, of course, when something that big has an air of tragedy, Maetel has to be there to observe it. And where Maetel goes, Tetsuro naturally follows. Now, don't get me wrong. This show isn't nowhere near the disaster the second season of Galaxy Railways ended up being. Which is to say, there was no parts of it I really hated or found to be stupid. It just feels a little bit like a by-the-numbers show, something that was made because an answer to that all-pressing question had to be provided. I'm willing to convene that maybe it wouldn't be neccesary to develop or portray Maetel's and Tetsuro's involvement in this -- after all, they've had a 113 episode TV series and three movies together -- but their involvement in this is strictly minimal despite being main characters of near-celebrity status. Still, entertained I was when the fourth episode rolled around, despite some rickety plot progressment. Maybe it could have been shorter, maybe it could have elaborated a bit more on the where and the why when it comes to the Galaxy Express and its two most famous of passengers. And maybe it was just nice to see them again in light of all this. Recommended Audience: This OAV has pretty much the same rate of violence, death and general tragedy as your average Galaxy Railways and/or Galaxy Express episode (which is to say fairly mild), so I'm going to go out on a limb and borrow the rating the first Galaxy Railways got on its DVD release.